Gold Music Note. Penguin sterling silver charms. This music note puts the words into music sounds. Learn about note reading with our Gold Music Note Italian charm. The note is placed on a shimmering link face and covered with gold enamel. The charm is made of nickel-free stainless steel and fixed to a medium size to blend with all 9 mm Italian charms. 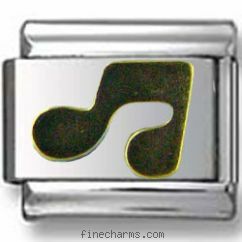 Our selection of Music notes proves you with different types of bracelet ranging from Black and Blue Music Notes to Sterling Silver Note Italian charms.